That time of the year is upon us – Ramadaan. The ninth month in the Islamic calendar. It commemorates the first revelation of the Quran to Prophet Muhammad (peace be upon him), and lasts between 29 and 30 days. Fasting is obligatory for adult Muslims, except those who are suffering from an illness, travelling, are elderly, pregnant, breastfeeding or menstruating. As well as fasting, abstaining from eating and drinking during daylight hours, Muslims are encouraged to read the entire Quran throughout the month. Muslims should engage in increased prayer and charity during Ramadaan. Ramadaan is also a month where Muslims try to practice increased self-discipline and self-restrain. With this in mind many of us have already started planning and stocking their freezers weeks and months before in preparation of welcoming this blessed month. Samosas, pies, quiche, spring rolls, doughnuts and traditional Cape Malay koesisters all of which can be made in advance and frozen for up to six months. This savouries and sweet treats can be fried, baked or sugared before iftar and served with a healthy soup for family and friends. Even though Ramadaan might seem like it’s not all that close, the earlier you are prepared, the better. Thinking of what to cook takes about as much time and effort as the actual task. Make the most of your time now to browse through recipes and try out dishes to assess the cooking time and the amount of effort required. Make a schedule for one or two weeks and rotate it during the month, or make it for all 30 days! You’ll save a lot of time during Ramadaan doing the prep beforehand. If you have older children get them involve peeling and chop onions, garlic, ginger, dhanya, etc. Freeze them in portions ready to use. Likewise, vegetables for soup can also be prepared now, peel, chop, liquidise pour into freezer bags. Before sunset children will be seen going from house to house taking barakats (plates of food or treats) to the immediate neighbours. 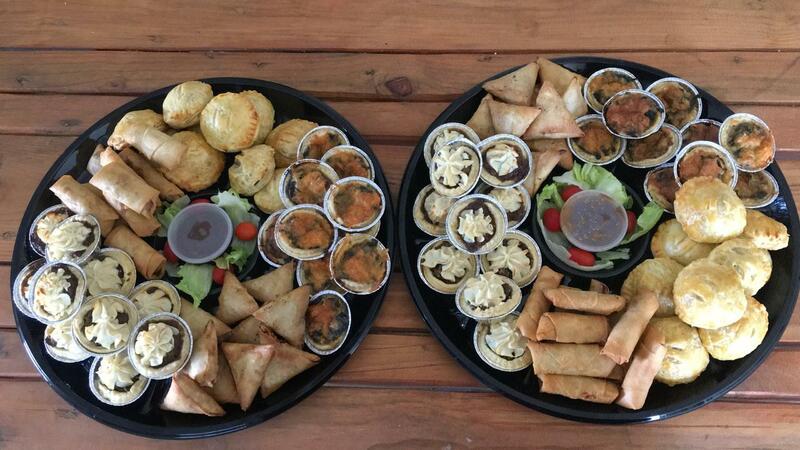 In a typical Cape Malay home Iftar will consist of dates, soup and savouries. Boeber, a milk drink, will typically be served with something sweet e.g. koesisters or fritters. After the prayer, a light meal will be served. Kebabs or burgers can be made, pre-baked and frozen. Homemade, no preservatives. You’ll get approximately 18 burgers from a kilogram of chicken mince. You may substitute the chicken mince with steak mince. Make chicken mince by shredding fillets in a food processor. Mix all the ingredients together in a large mixing bowl. Cover and refrigerate overnight for the flavours to develop. Next day shape the mixture into burgers or use a burger shaper. Separate the burgers with round pieces of greaseproof paper, big enough to cover the whole burger. Freeze until needed. This mixture can also be used to make chicken kebabs. Pre-bake for about 6 minutes in the oven to hold the shape (can be frozen at this point) before putting the kebabs on the grill. Cook from frozen. Serve with naan bread and a healthy salad for a scrumptious meal. For Ramadaan we all want quick and easy recipes, the following recipe is no exception. This two ingredient recipe can be used to make naan bread as well as pizza bases. Mix the self-raising flour and yoghurt in a bowl until the mixture forms a dough. Leave to rest for 15 minutes. Roll the dough out onto a floured surface into the desired shape or size. Brush with a mixture of melted butter and oil on both sides. Alternatively add garlic paste to the oil mixture to give it a garlic flavour, garnish with freshly chopped dhanya. Cook in a pre-heated oven at 200C for 10-15 minutes. For naan bread turn half way through baking. Makes 2 large pizza bases or 8 naan breads. A meal idea for Suhoor (pre-dawn meal) is to make mini Frittatas which can be prepared the night before and pop into oven in the morning. Mix all the above ingredients in a bowl. Spoon into a greased muffin tray. Bake at 180C for 15 minutes. Makes 12 Frittatas. Cooks tip: substitute with any other vegetables of choice. Left over sausages, chicken or meat can be added as well. Another easy and quick meal is lamb or mutton chickpea pilau. The meat can be substituted with chicken pieces which reduce the cooking time significantly. No potatoes are added instead chickpeas are used. Lamb/Mutton or Chicken Pilau Rice. Soak the rice in hot water to cover for 30 minutes. Meanwhile using a large heavy based pot melt the butter with the oil. Fry the onions until golden. Add the lamb, mutton or chicken pieces and spices and cook until done. This will take approximately 20 – 40 minutes depending on the type of meat. Add the chickpeas. Salwaa Smith is the author of Cape Malay & Other Delights Cookbook. Salwaa is the third generation Cape Malay cook in her family and is the founder of Cape Malay Cooking & Other Delights on Facebook and other social media. Salwaa offers Cape Malay cooking experiences for locals and tourists at her purpose build kitchen in Newfields on the Cape Flats. In addition, she also founded the popular Little Chef Cooking and Baking Club for children which is held during school holidays. Salwaa has her own range of pre-mixed cooking sauces and spices which can be purchased online at https://capemalaydelights.store or from her kitchen in Newfields.